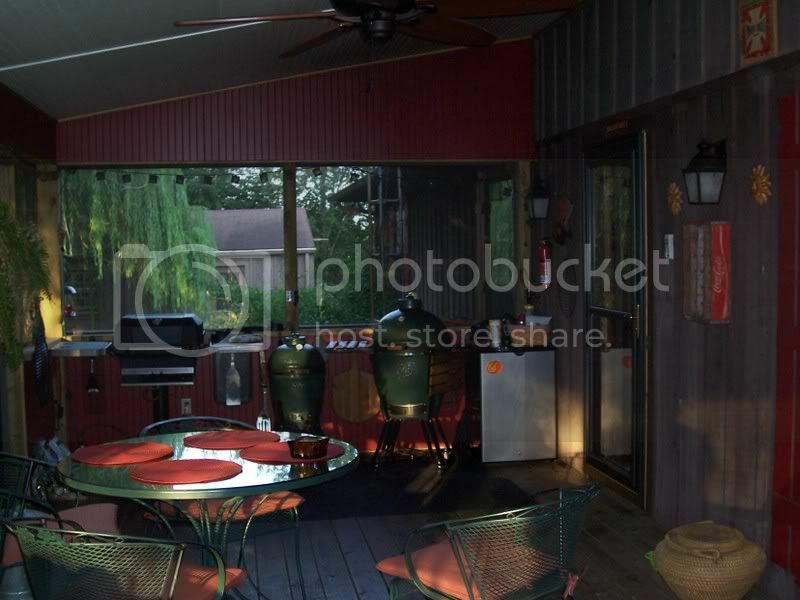 Anyone put a BGE on a screened porch? 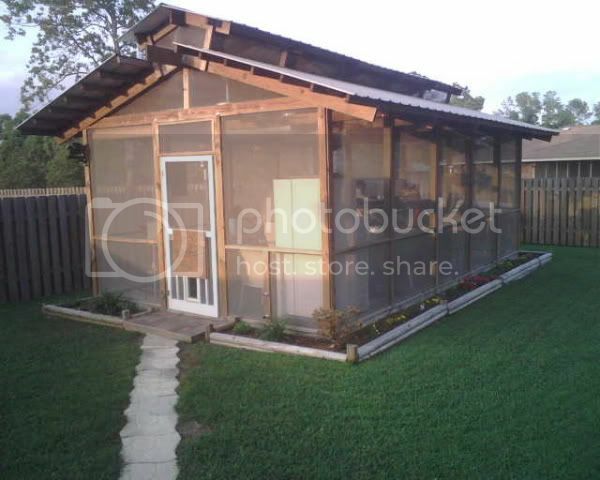 We want to build in the BGE on our screened porch which is fairly large with 9 ft ceilings but we are concerned about the amount of smoke it puts off...if it will be a nuisance or stain the ceiling which is painted white bead board or house which is hardiplank. We want to put a vent hood over it but don't know if that will change the way it cooks as far as the temperature. Any help? Thanks? I have mine in a 15 x 20 screen pool enclosure next to the house with no problems. Thanks...I see your an expert egger...any opinion on the vent hood? but i think his roof is glass? I have my large under a SunTuf ceiling, with the sides screened in. The roof is peaked but I can't tell that the smoke has hurt it at all in the three years or so I've had the egg out there. I know it hasn't changed the color of my Hardy board. I would bet that after a while your white bead board is going to show some smoke coloring. Somewhere here there is a post showing how to vent an Egg to an outside wall to prevent just this very thing. I wouldn't have a clue on how to find it, but the post had something like AC vent tubing running to the screen and was just attached after the lump was ready to cook on. I have mine on a screen porch. I have two skylights that open and a ceiling fan that helps eliminate any smoke. I will admit that the fan blades do get rather groddy over time though. Here's a picture of BobbyB's cook shack. I was at his house for dinner last night and saw no problems associated with his three eggs being inside a screened in enclosure. I had my Egg on the screened porch for 5 years. I had a very low ceiling, like 7 1/2 feet. I had some smoke shumutz on the aluminum maybe a little on the screens but an easy fix with a power washer. At nine feet, I would not be too concerned but you will have to be proactive and do a power wash once a year. Funny you should ask…We live outside of New Orleans and evacuated for Hurricane Gustav 2 weeks ago. In preparing the house for 100 mph winds I rolled my Egg into the screen porch (the garage was full). We returned home to no damage (lost 2 small trees). So I was being lazy and said “what the heck, just going to do some burgers” and left the Egg on the screen porch. Well I’ll never do that again. My ceiling is 9 feet but it’s made of a vinyl material similar to the siding on the house, and right above the ceiling is the attic, which has a good layer of insulation on it. Well the smoke rose up and worked its way into the attic and then pretty much filled the house with smoke, mostly in the bathrooms b/c of the fresh air fans in there. The burgers were good but man you could smell them for days inside the house! Thanks for stepping in for me! If you look at the "old" cook area (look at the "before construction" page at the bottom) you will see that the ceiling there was aluminum and about 7.5 feet. It did get smoke covered after a few years of Egging. The "new" kitchen roof is screen, not glass, so the smoke just rises away. I keep mine under an aluminum carport roof that is approx. 8' high. For the first few months I didn't notice anything but you can hear the aluminum stretching from the heat when you first light the egg. Now after about 6 months I can see visible buildup which is sort of a smokey yellow/brownish color. It doesn't seem to be a serious problem so I just plan to power wash it once a year. With a flammable roof I wouldn't go any less than 9' and I would recommend fans or vents on the ceiling to keep air moving, especially on a flat ceiling. Wow. That's kinda almost inside. Looks like a really nice comfortable place to cook. Very nice. Real nice sanctuary you gots there! Hope all is well down in our next door state. Weather sure is purty here in Virginia.